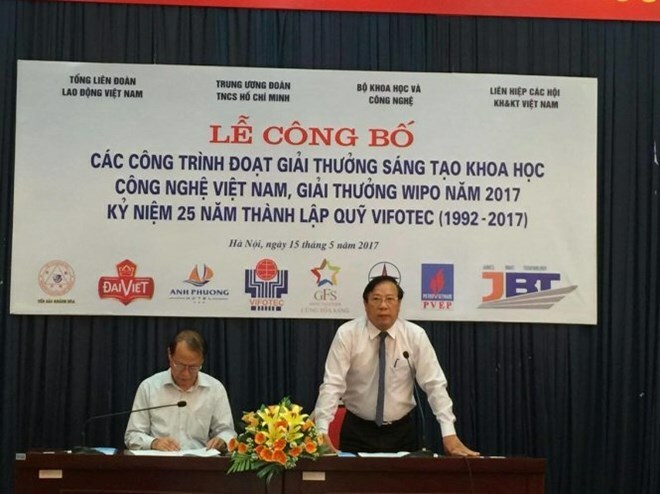 Hanoi (VNA) – Some 45 scientific and technological inventions and applications of Vietnamese scientists and businesses will be honoured by the Vietnam Fund for Supporting Technological Creations (VIFOTEC) at a ceremony held in Hanoi on May 16. According to PhD Pham Van Tan, Vice Chairman and General Secretary of the Vietnam Union of Science and Technology Associations (VUSTA), the awards include four first prizes, nine second prizes, 15 third prizes and 17 consolation prizes. Among the four first-prize winning projects, two have also been selected for the World Intellectual Property Organisation (WIPO) awards, which are projects “Manufacturing 56-seat boat using polypropylene carbornate” by Nguyen Kim Son from James Boat Technology Joint Stock Company and “Cultivating citronella on land affected by climate change to extract essence” by PhD Le Van Tri from Biotech Joint Stock Company. Other honoured projects are in mechanics-automation, material technology, information and technology- electronics-telecommunication, biology, technologies to cope with climate change, protect the environment and save energy.